The recipe has an auspicious beginning — one stick of butter, mixed together with corn syrup and brown sugar. 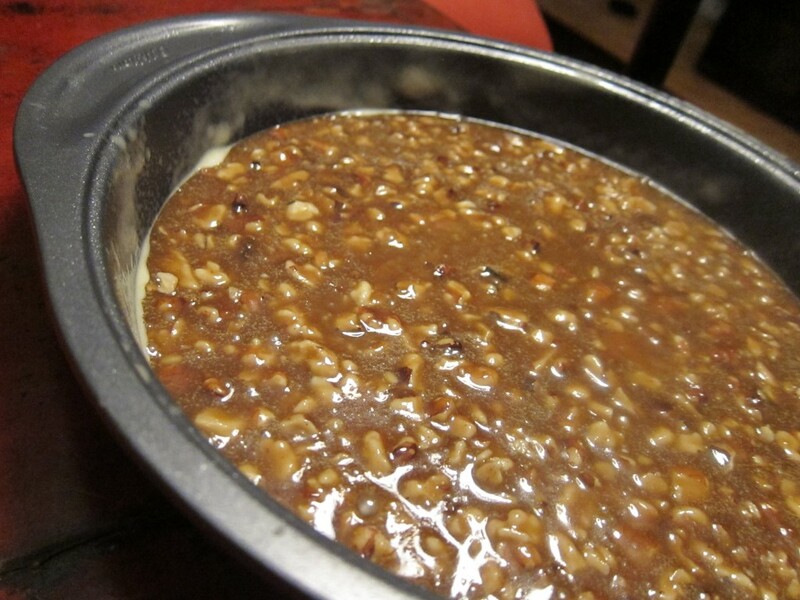 The mixture gets melted in a pan and then chopped walnuts are stirred in. This will form the glaze of this upside-down cake. Note: When making the caramel topping, watch the clock carefully — you don’t want the mixture to simmer too long or the topping could be too hard, making the cake difficult to bite into. Trust me, I’ve learned this the hard way. After that, the recipe is simple — cake flour, eggs, rum, mashed bananas and more are mixed together and then poured into the pan. Once that’s in the oven, it’s helpful to have snacks on hand while you’re waiting for the cake to bake — the smells coming out of your kitchen will make you insanely hungry. As cakes go, this one’s pretty easy — and delicious to boot. The banana base is light and buttery and the caramel-walnut glaze adds a deep, almost-chocolaty sweetness and crunch that gives each bite a nice little kick. I’d like to think the good doctor would approve. Spray 8-inch round cake pan with 2-inch-high sides with nonstick spray. 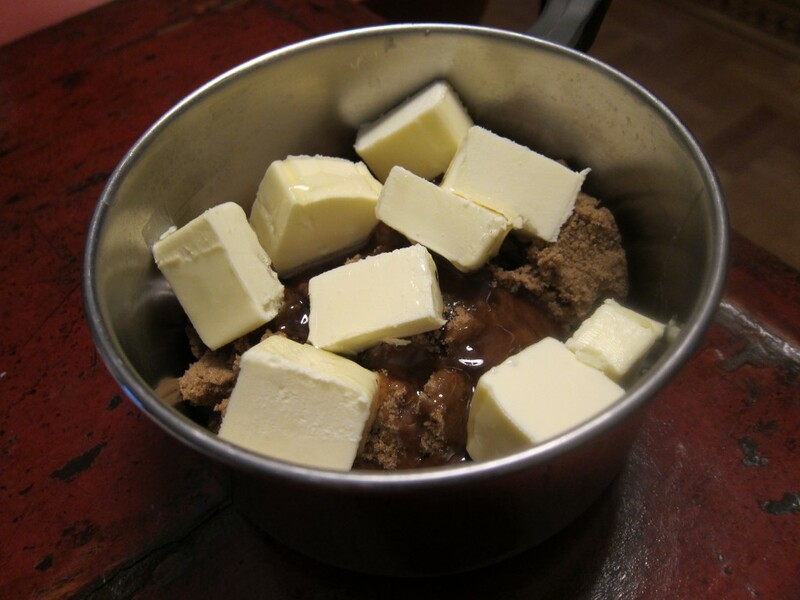 Bring butter, sugar, and corn syrup to boil in medium saucepan, stirring constantly until butter melts. Boil syrup 1 minute. Stir in nuts. Spread topping in prepared pan. Let topping cool completely. 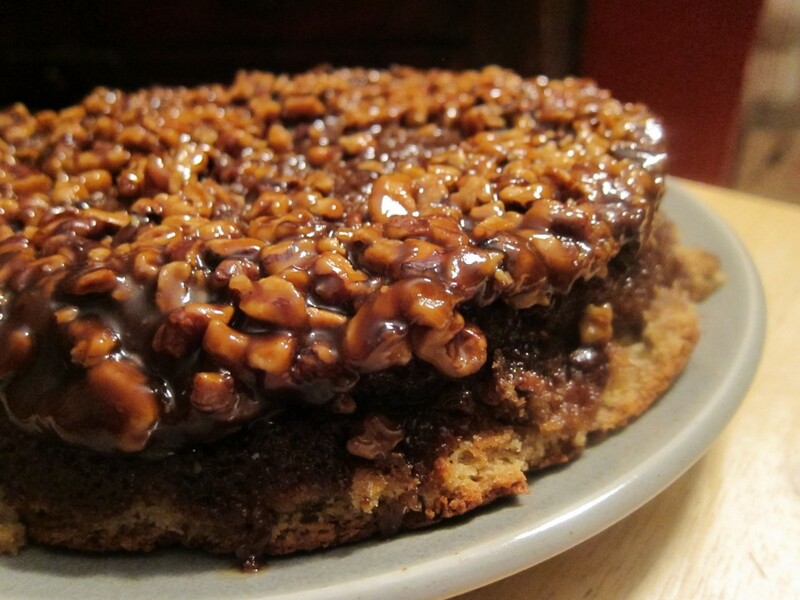 This entry was posted in Baking, Cake, Dessert, Recipes, So Good It Must Be Bad For You, Sweets and tagged Baking, Banana, Cake, Caramel, Dessert, Sweets, Walnut by Cheryl. Bookmark the permalink. Oh damn you! Now I have an insane craving to make this! But I’m a lazy baker and don’t own an electric mixer (horrors)… Hmmm but I’m so tempted to do this by hand… it has everything I love – crackle caramel, walnuts, butter, BANANA…. darn. I feel a bake coming up! I am absolutely in love (with this picture and this blog). Saw the article about you on Poynter and you are such a great inspiration for this young business journalist and budding foodie. Thanks for the kind words, Carla! Hope you enjoy the book, too…Cheers.